If you love visiting California's ancient missions when you travel around the state, a story I wrote this week will appeal to you. It involves a group of equestrians setting out this Sunday from the mission in Sonoma (built in 1823, it was last of the 21 missions). 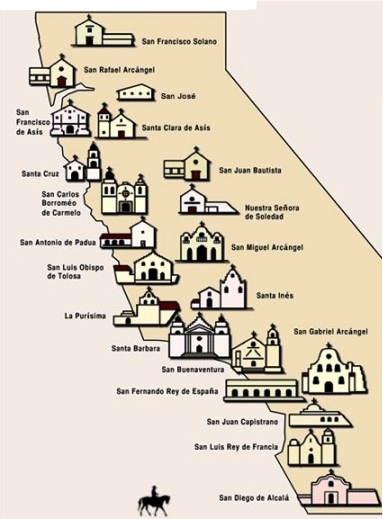 They'll be heading south, visiting each mission until they arrive in San Diego, where the first mission was constructed in 1769. This weekend Sonoma has the honor of being the starting point for a unique and historic adventure, one that involves the city’s treasured Mission past. Two long-time friends, writer Leslie Dunton-Downer and filmmaker Gwyneth Horder-Payton, are embarking on a Mission-to-Mission horseback ride. 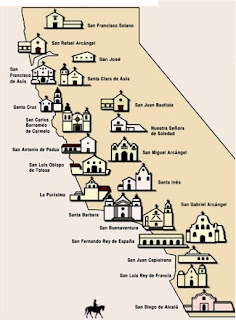 They’ll be heading in the reverse direction in which the Missions were built, leaving from Sonoma’s Mission San Francisco Solano (completed in 1823) and ultimately arriving at the earliest mission, San Diego de Alcala, which was founded in 1769 by Father Junipero Serra. Just about everybody enjoys a farm stay, from urban sophisticates who revel in the farm-to-table food, to couples who want a quiet but interesting stay in the country. But, let’s face it, nobody could love a farm stay more than a kid. They encounter many new sights, experience much that they’ve probably never done, and there is plenty to learn. And whether it’s looking or doing or learning, it’s all tremendous fun. To read more, connect to this post on Sonoma County Tourism Bureau's "Inside Sonoma" website. Sonoma, California, where I live, is definitely on the forefront of the sustainable/organic/artisan food trend. That's one of the reasons it was named in 2009 as the first Cittaslow ("slow city") in the United States by Cittaslow International. It's the kind of place where people have been hand-crafting foods in the same way for so long that their methods had time to go out of fashion and circle around to being trendy once again. For instance, Sonoma's award-winning and family-owned Vella Cheese Company has produced hand-crafted cheeses for more than 80 years in a gorgeous stone building--a former brewery--that dates back to 1904. Vella's father, who died last June, won more than a hundred gold and silver medals throughout his long career as a cheesemaker. He was so esteemed by cheesemakers throughout the United States that, in 2006, he was honored with the first-ever lifetime achievement award by the American Cheese Society. 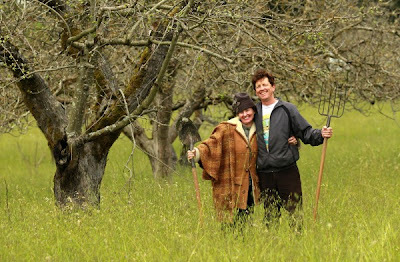 Read the story of Vella Cheese Company here. Last Friday night I attended Livermore Valley's "Taste of the Best Winemaker Dinner," featuring medal winners from the 2012 San Francisco Chronicle Wine Competition (I was covering the dinner for Tasting Panel magazine). 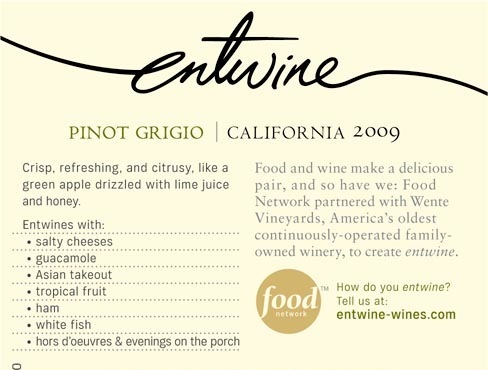 The event was held at Wente Vineyards, where Catering Executive Chef Jeff Farlow created very successful pairings (see below). Another commitment forced me to leave before the dessert reception. Held in a separate room, the desserts were paired with a specially selected wine from each winery. BTW, my favorite pairing was the last--the Syrah with the mesquite-grilled flat iron steak. Each component was perfect on its own, but melded together in a way that transported me heavenward. Yummy! The richness of the Ahi Tuna Carpaccio was refined by a surprising (and appealing) tart-salt edge, all of it mellowed and coming together beautifully with a sip of Cuda Ridge Wines Merlot. Click to enlarge. To convert liters to gallons, multiply liters by .26418. To convert liters to cases, divide liters by 9. 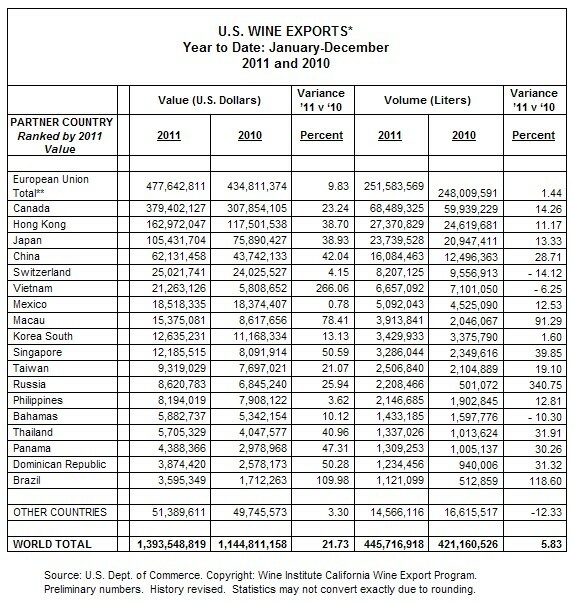 The Wine Institute sent news via press release early this morning that U. S. wine exports increased 21.7% in 2011 over the previous year, for a record high of $1.39 billion. Ninety percent of the nation's wine exports are from California. SAN FRANCISCO – U.S. wine exports, 90% from California, reached a new record of $1.39 billion in winery revenues in 2011, an increase of 21.7% compared to 2010. Volume shipments were up 5.8% to 455.7 million liters or 50.6 million nine-liter cases. “Wine Institute’s work with the U.S. government and key international organizations such as the World Wine Trade Group, the Asia-Pacific Economic Cooperation and FIVS continues to have a valuable impact in facilitating trade. Export growth in 2011, however, reinforces the need to continue eliminating unreasonable trade barriers, particularly in the Pacific Rim where wineries are burdened by protectionist tariffs and duplicative regulations costing Asia-Pacific economies close to $1 billion per year,” said Wine Institute’s International Trade Policy Director Tom LaFaille. 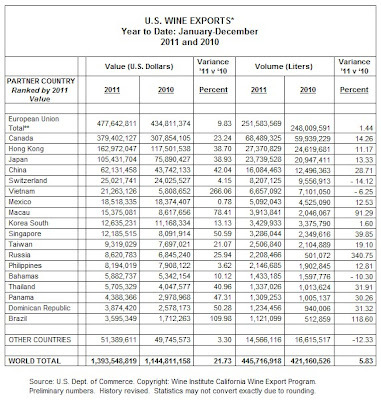 Thirty-four percent of U.S. wine exports by value were shipped to the 27-member countries of the European Union, accounting for $478 million of the revenues, up 10% from 2010. Volume shipments to the EU reached 28 million cases in 2011, edging up 1.4% from the previous year. Other top markets were: Canada, $379 million, up 23%; Hong Kong, $163 million, up 39%; Japan, $105 million, up 39%; and China, $62 million, up 42%. “California wines continue to grow in popularity with both trade and consumers in the Canadian market,” according to Rick Slomka, Wine Institute Trade Director for Canada. “Some of the recent growth comes from new brands with eye-catching labels and clever names. Also contributing to this growth is the ongoing strength of the Canadian dollar which has made California wines more competitive compared to wines from other major wine regions. Our continued success with premium wines in the Quebec market and in LCBO VINTAGES, indicates that Canadian consumers see good value in California at all price points,” said Slomka. “In a challenging economy, the UK wine market does not stand still, and new sectors and opportunities have arisen. 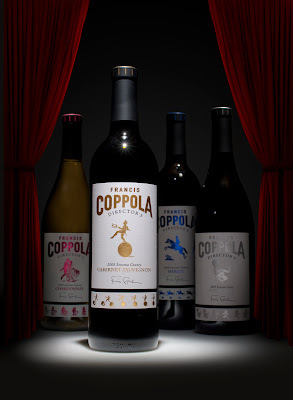 California has been responsive to these, and has built on the bedrock of its major branded wines with successes in the independent retail sector and on-trade outlets. Growth in these areas introduces our wines to new audiences, and enables California to demonstrate its diversity at higher price points. This growth is by no means exhausted, and augurs well for the future here,” said John McLaren, Wine Institute Trade Director for the United Kingdom. 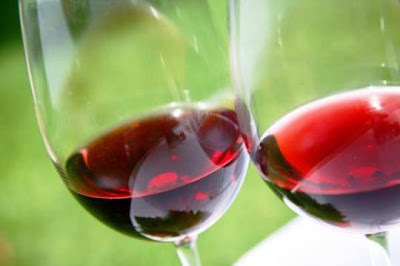 "California wines fared well in most European countries. In Sweden for instance, sales growth of California wines were the highest of all wine supplying countries in Sweden. The story was similar in Germany, where California again experienced the highest growth rate of all wine exporting countries. However, a significant portion of California wine imported into Germany is re-exported and actually sold in other European markets. Additionally, as a word of caution, the 10% change in the Euro/Dollar exchange rate of the past few months may have an effect on exports to Europe in early 2012,” said Paul Molleman, Wine Institute’s Trade Director for Continental Europe. “The outlook in the world’s emerging wine markets remains positive as most markets continued to post strong gains in 2011. Hong Kong remained California’s third largest export market by value, although growth slowed to 39% from 150% in 2010 compared to 2009. China’s growth remained buoyant at 42% compared to 2010 and is now the fifth largest export market by value, up two places from last year. Vietnam posted the strongest year-over-year gains (+266%) among the top 25 markets. Elsewhere, there is significant optimism in South Korea due to the recent ratification of the Korea-U.S. Free Trade Agreement and in Mexico where the 20% import tax on California wines was repealed in late October 2011," commented Eric Pope, Wine Institute’s Regional Director, Emerging Markets. “U.S. bulk wine exports to Japan have been growing as major Japanese importers are now importing popular-priced California wine brands in bulk and bottling in Japan. This reduces the burdensome import duty to a certain extent and makes inventory control easier. As per bottled U.S. wine, Japan is now importing more expensive California wines than in the past. Unlike other new world wine exporting countries, California wine is well represented at high-end restaurants because of our successful annual restaurant promotion,” reported Wine Institute Trade Director in Japan, Ken-ichi Hori. Since 1985, Wine Institute has served as the administrator of the Market Access Program, an export promotion program managed by the USDA’s Foreign Agricultural Service. For more information, see: www.wineinstitute.org. 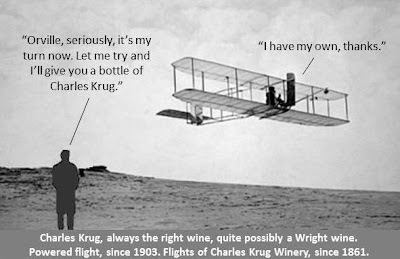 Founded in 1861, Charles Krug Winery is the oldest winery in Napa Valley. Krug pre-dates a lot of devices that have been around forever, and which we take for granted -- like lightbulbs, airplanes and the telephone. The winery's longevity gave its marketing department an idea: they would show just how very old Krug is by pairing the invention of ancient devices with Krug's existence. As an example, take a look at that photo of the Wright Brothers at the top. They invented powered flight in 1903, but Charles Krug had already been around for 42 years at that point, which leads to the photo's quote: "Charles Krug, always the right wine, quite possibly a Wright wine." Go on over to Krug's Facebook page and see if you can come up with a clever caption for the Statue of Liberty photo you find there (she didn't arrive in the US until 1886, 5 years after Krug had been founded). If you can dream up a winning quote for the photo, you will win what has been described to me as "a very special t-shirt" and get Krug bragging rights in the bargain. 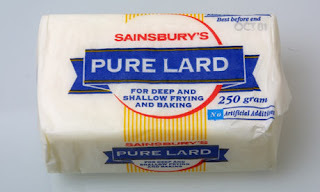 Apparently there is some evidence that lard has gotten the kind of bad rap that's not entirely deserved. A century ago, lard was used in every kitchen in America. 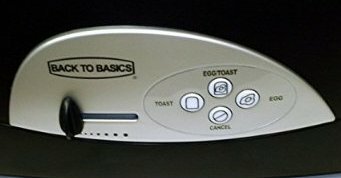 It was the #1 cooking fat, used by everyone. But when lard fell from grace, it was a quick and steep plunge. Smith refers to the old-time, big-money lard business as the “lard-industrial complex.” It’s an amusing, and at times fascinating, tale. You can read the audio text or listen to the audio here. The National Restaurant Association estimates that 48 million Americans will order takeout/delivery food while watching the Super Bowl this Sunday, February 5. The five most popular food items of the day: salsa/dips/spreads (69% of survey respondents), chicken wings (63%), pizza (61%), desserts (50%), and healthful food items (42%). In addition, 12 million people are expected to visit a restaurant or bar to watch the big game. Younger adults 18-34 years old constitute 52% of this group. The next highest percentage is people with children, at 40%. People on the West Coast are nearly twice as likely to watch the game at a restaurant or bar as people on the east coast (9% in the west, 4% in the east). This is probably due to the earlier kick-off time in the west. Single Malt and other fine whiskey fans know that the shape of a glass can maximize enjoyment of its contents. Part of this has to do with aesthetics—the simple pleasure of holding and admiring a beautifully-designed glass. But equally important is that a glass with the right size and shape enhances aromatics, and thus taste. Back in 1992, in a quest to develop the ultimate whiskey glass, famed Austrian glassmaker Riedel brought together a panel of Scotch whiskey experts to test nineteen different glass shapes. Later, with the help of master distillers in Scotland, the company continued making refinements. The result? The perfect glass for any fine whiskey. 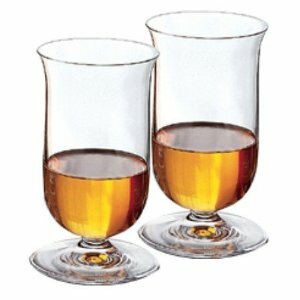 Shaped like an elongated thistle on a truncated stem, the Riedel whiskey glass possesses a slightly outturned lip. This long glass, warmed by the hand, permits the release of aromatics perceived by the nose in a slowly-unfolding, multi-layered sequence of discovery. And that’s even before the shaped lip directs the whiskey to the tip of the tongue, from where it expands into the mouth for that first velvet feel. Riedel makes two versions of its whiskey glass. I don’t recommend the expensive, hand-blown Riedel Sommeliers Series Single Malt Whiskey Glass, which cost about $55 each. They’re extremely thin and--a major drawback for me!--they break easily. However, the machine-made, reasonably-priced Riedel Vinum Single Malt Whiskey Glasses offer beauty, utility, and value: a set of two costs $47. The glasses are beautiful and thin (but not so thin that they break if you look at them the wrong way). They possess no “machine” seams, and the Riedel name is etched on the base. They stand 4.5” high and hold 7 ounces. Although they’re dishwasher-safe, hand-washing is recommended. And if you want to learn more about single malt scotch, you can't do better than British writer Michael Jackson's classic Michael Jackson's Complete Guide to Single Malt Scotch. It's the 2015 updated edition. According to a marketing study by Vinexpo, wine consumption will continue to grow swiftly in the US and China over the next four years. Conversely, a tough economic climate will create little increased demand in the "mature" (read "already-saturated") European market. In 2011, the US officially overtook France and Italy to become the world's biggest wine consumer by volume. However, China is expected to overtake the US, becoming the world's largest wine market, within twenty years. Between 2011 and the end of 2015, the US and Asia will drive a 6% increase in global wine consumption. By comparison, consumption rose by 4.5% between 2005-2010. Read the whole story and a lot more statistics at just-drinks. I've never paid much attention to Paul Deen for the obvious reason: way, way too much fat and sugar in her recipes. Apparently I wasn't alone in my feelings. On January 4, nearly two weeks before news of Deen’s 3-year-old diabetes diagnosis was revealed to the world, PCRM – Physicians Committee for Responsible Medicine – included her Southern Cooking Bible on its list of 2011's worst cookbooks. 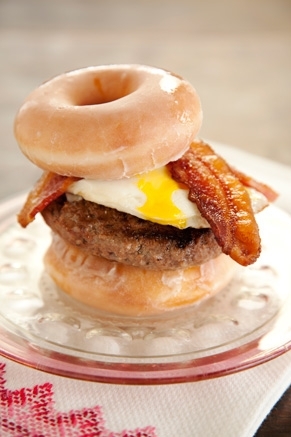 There is also compelling evidence that such diets lead to Type 2 Diabetes. Deen has faced extensive criticism for the high amounts of fat, salt, and sugar in her recipes. She faced particularly strong objections with the release of Lunch-Box Set, a cookbook aimed at children, with Barbara Walters saying of the book, "You tell kids to have cheesecake for breakfast. You tell them to have chocolate cake and meatloaf for lunch. And french fries. 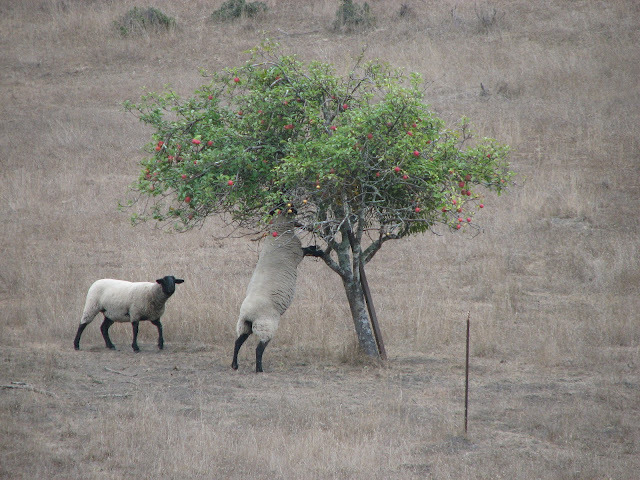 Doesn't it bother you that you're adding to this? "Celebrity chef Anthony Bourdain commented in 2011 that he "would think twice before telling an already obese nation that it's OK to eat food that is killing us." On January 17, 2012, Deen announced that she had been diagnosed with Type 2 diabetes three years ago, a disease for which a high fat diet is a major risk factor. It was also disclosed that Deen is a paid spokesperson for the Danish pharmaceutical company Novo Nordisk. She was called a hypocrite for continuing to promote her high fat diet while only disclosing her medical condition when it benefits her in representing the drug company to market their diabetes management program.Deen stated on the January 18, 2012 episode of The Chew that a portion of her compensation would be given to charities. The Cook’s Illustrated Cookbook: More than 50 pages of recipes featuring grilled meat, which increases cancer risk. The Neelys’ Celebration Cookbook: Bourbon Bread Pudding is saturated with butter, half-and-half, and whole milk; high-fat diets increase heart-disease risk. 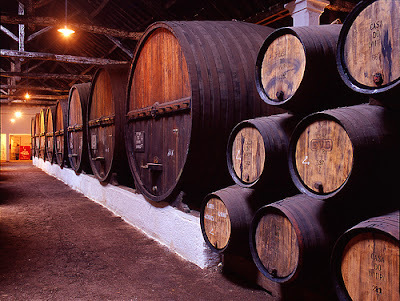 January 27, “Port Day,” celebrates Portugal’s renowned fortified wine. As part of the celebration, the Center is hosting a contest encouraging U.S. consumers to photograph their favorite authentic Port wines. To enter the contest and possibly win an iPad 2, send a picture of an authentic Port label to wineorigins@clsdc.com with the subject line “Port Day 2012 Photo Contest Entry.” Alternatively, you can post the picture to your Facebook profile, tagging yourself and the Center for Wine Origins in the picture. One Grand Prize winner will be selected randomly on January 25 to receive an iPad 2. Complete contest rules are available here. 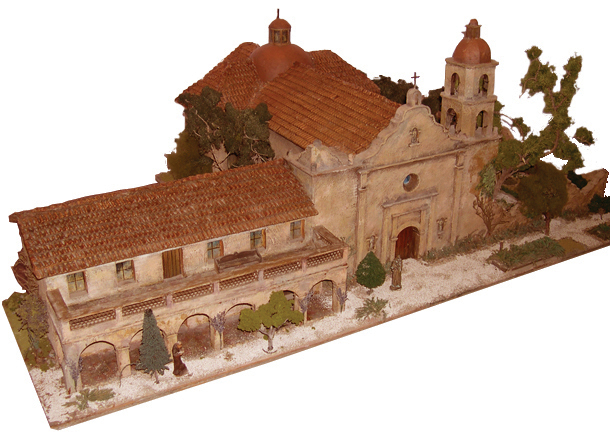 The Mission Museum's 1939 replica of the San Luis Rey Mission. One of the best things about being a freelance writer living in wine country is that I get to to meet and interview so many wine industry people who love the work they do, from winery owners and winemakers to tasting room tenders and cellar rats. I particularly enjoy profiling wine country folks who use their profits to accomplish a bit of good in the world. On that score, I've admired Fred and Nancy Cline from the moment I stepped into the small museum they built on the grounds of Cline Cellars. The California Missions Museum houses a one-of-a-kind collection: large, hand-crafted replicas of all 21 California Missions. 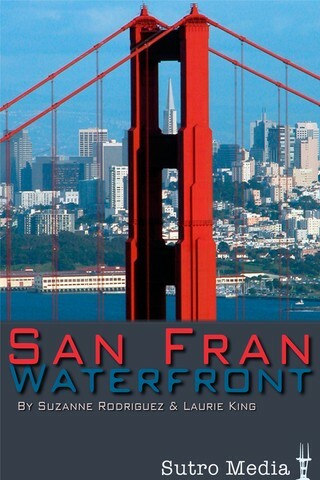 The replicas were built in 1939 by a team of German woodworkers for the World's Fair held that year in San Francisco. The collection managed to stay intact until the late 1990s, at which time it was set to be auctioned off piece by piece. The history-loving Nancy Cline, believing that the Mission replicas should remain a set, purchased them all at auction. The Clines then built a home for them at Cline Cellars, opening the doors to the public. Admission is free. 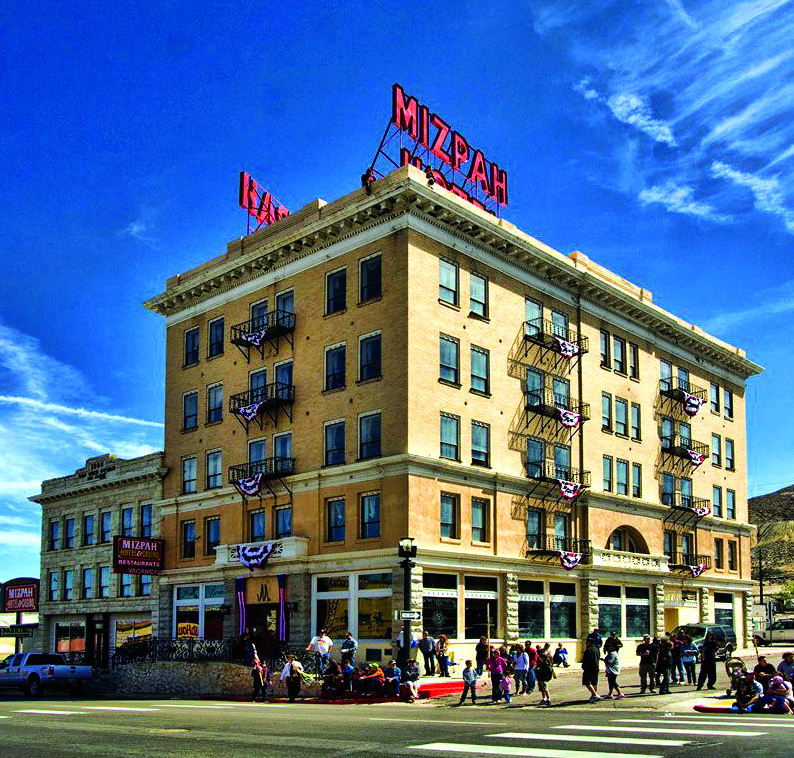 Last year 4,000 California 4th graders visited the museum as part of their history curriculum. 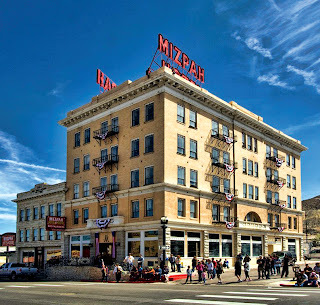 Just this year the Clines purchased and refurbished an historic hotel in Tonapah, Nevada. It makes for an interesting story, which you can read in my recent published profile of Nancy Cline. Wine.Woot founders, brothers David (left) and George Studdert, sampling wines. Photo: Christa Jeremiason/PD. One of the Internet's earliest and most successful flash sales sites, wine.woot, keeps a deliberate low profile. So low, in fact, that I had no idea the company was founded and based in the town of Sonoma, California, where I live. An offhand remark at a party tipped me, and I ended up doing a story about wine.woot for the Santa Rosa Press Democrat--it ran on Sunday, January 1. The company did well until the U. S. Supreme Court’s 2005 Granholm ruling opened the door for wineries to ship directly to consumers. While that was great news for wineries and consumers, it essentially put David out of business. But another door opened almost simultaneously. David had recently read a Wall Street Journal article about a new company, woot.com, that had pioneered the one-discounted-deal-a-day online business model in 2004 (woot.com was purchased by Amazon in 2010). 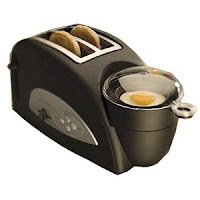 He was intrigued by the one-daily concept and loved the site’s humorous sales approach. The next day David sent an email to woot’s founder, Matt Rutledge, who immediately saw the possibilities in wooting wine. Talks ensued and, in May 2006, “almost a year later to the day,” wine.woot became the first offshoot launched by woot.